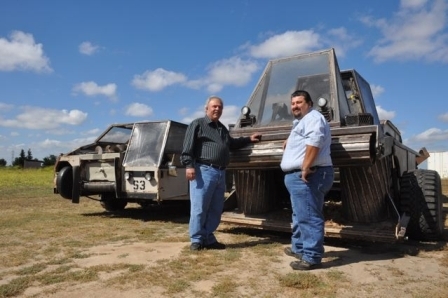 A Madera man put his knowledge of good equipment to use by starting and running a business that depends on it. Rojelio “Roy” Castillo Sr. became interested in farm equipment after he went to work for a valley company known as JackRabbit in the 1980s. After the Ripon company built its first chipper in 1982, he began driving the machine and managing the department. Encouraged by Earl Anderson, the owner of JackRabbit, Castillo bought his first chipping machine to accommodate growers in managing and disposing of their orchard waste. Furthering this idea, he started his own business — Roy’s Jackrabbit Chipping, which is based in Madera. After the grower prunes an orchard and stacks the wood, the chippers chip the wood into 1-1/2 inch pieces. The chips are then removed and delivered to biomass plants all over the Central Valley for burning and to dairies for bedding. “Estimates of cost depend on how heavy the pruning is. Some of the money comes from the farmer and some of it comes from the biomass company,” Castillo said. Castillo continues to credit the company that got him started — a company he still represents. Meanwhile, he uses the support of his son, Rojelio Castillo Jr. to help manage and run the seasonal business and keep the books. In December of 2007, Rojelio Castillo Jr. married Normalee Gutierrez Castillo who moved from Washington State where she also came from a farming family. Her father Horacio Gutierrez worked for 28 years with Noble Farms which grew potatoes, hay, and corn and also owned their own cattle company. “Taking the Executive Assistant position in March of 2008 at the Madera County Farm Bureau has been one of the most exciting and most interesting jobs I have had by far. I have learned many different things from water rights laws, to how to drive an almond shaker, and what a persimmon is, to maintaining a top notch website and helping throw fabulous wine tasting parties,” says Castillo.